Heating System Efficiency has a huge impact on heating costs and on the planet, the greater the efficiency the less the cost. This webpage shows UK 2017 heating efficiencies and details of a new available extremely efficient Solar Heat Harvester system that transfers solar heated air from hot areas in your home to cooler areas and typically achieves a home heating efficiency 10 to 50 times higher than all the others. The following table was derived from SEDBUK 2017 data. SEDBUK stands for 'Seasonal Efficiency of Domestic Boilers in the UK', it is an energy efficiency rating scheme which was developed by boiler manufacturers and the UK government to enable a fairer comparison of the energy efficiency of boilers. The UK 2017 home heating systems comparison charts below compare the efficiencies of our Solar Space Heating systems that use new energy saving fans, with the efficiency of current home heating systems. The energy efficiency of the heating systems in the table are fixed i.e. they are not dependent on air temperatures. 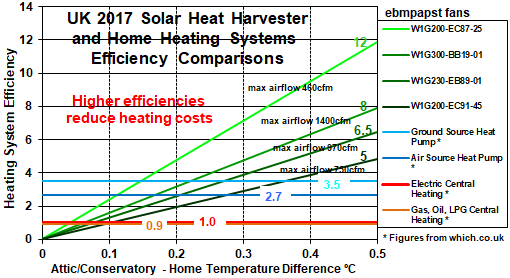 In contrast the efficiencies of Solar Heat Harvester systems are directly proportional to the hot – cold air temperature difference, and to the rate of airflow achieved. The impact of both temperature difference and air flow rate are shown in the charts below. The huge advantage of Solar Heat Harvesting Systems is that very high heating efficiencies can be achieved at very low cost. Even at an air temperature difference of just 0.5°C the efficiencies of both Attic and Conservatory Heat Harvester systems exceed that of the other heating systems. 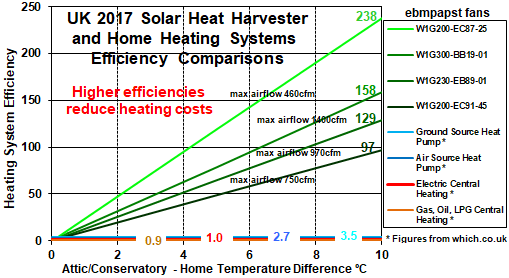 Solar Space Heating System efficiencies at home – transferred air temperatures up to 10°C are 20 times higher, as shown below. Data for Solar Heat Harvesting Systems in the charts was derived from a thermodynamics equation shown below. Typical average annual attic/conservatory – room air temperature differences during the time recorded by our Solar Space Heating systems range from 5 to 10°c and efficiencies achieved range from 30 to more than 100. The home heating system efficiency is inversely proportional to the energy used to transfer the heat. The prototype Attic Heat Harvester system in Balerno, Edinburgh, used a fan that consumed 90 watts, the flow rate achieved is very dependent on the system ducting length and straightness. The flow rate achieved at the Balerno installation, where the air path was long, tortuous and restricting was 1200cmf, the fan is capable of achieving a flow rate without restrictions of 2000cmf. Our solar Space Heating Systems can use any fan/blower, we have tested a wide range of fans, some very new, against a number of criteria.